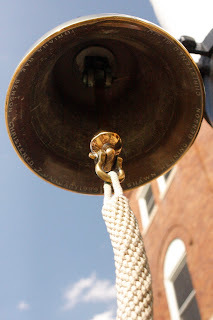 This bell on the Navy base is only allowed to be rung during wedding ceremonies and baptisms.... Individuals that have gotten married on the base or baptized receive the honor of having there name inscribed on the inner part of the bell.... notice not very many get the opportunity for this occasion. It was a lot of fun going to all the monuments with Eleanor her whole family is involved with the those who serve to keep our nation safe... it was so neat to hear reasons why men and women wear certain uniforms, different ranking system and to hear stories of her brothers serving... it brought such a deeper meaning and gratitude to my heart for our military men, women and there families. Mike wanting to take a cool shot between the statues and me being a goof ball.... Mike says " this picture would have turned out so good if you would have smiled, why are you always goofy when I want to take pictures of you? " Erin says... " I get embarrassed when you take pictures of me because you make me blush "
The following pictures touched my heart and made me cry the Men and Women who serve our country I will be eternally grateful for and will support them forever. "Tell them that we gave our todays for their tomorrows"
Those shots are gorgeous. I love how everything there is rich with history. I love that quote about how our service men and women gave their todays so that we can have our tomorrows. It makes me want to cry. I'm lucky to have this time in the land of the free. Eleanor, you're lucky you got to go & Erin's right, you are very pretty!